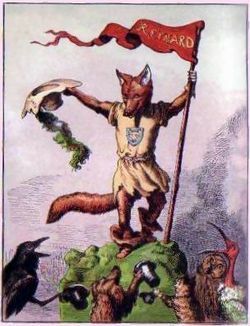 Reynard the Fox is one of Europe's most beloved folk legends, in which the eponymous character is a peasant-hero outsmarting Leo the King. A couple of quotes that roll off the tongue: "How bruyn the bere spedde wyth the foxe"; "The kynge..saide to brune the bere, syr brune, I wyl that ye doo this message." The patrimonial French word for "fox" was goupil from Latin vulpecula. However, mentioning the fox was considered bad luck among farmers. Because of the popularity of the Reynard stories, renard was often used as an euphemism to the point that today renard is the standard French word for "fox" and goupil is now dialectal or archaic. Thus, this story has effectively given the world two proper-to-common animal words. Strange.